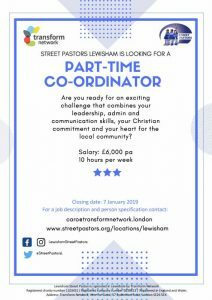 A great opportunity has arisen for a part-time Coordinator who can take forward the work of Street Pastors in Lewisham. This part-time role is varied, including co-ordinating and administering the patrols of the teams on the streets and the recruitment of new volunteers. 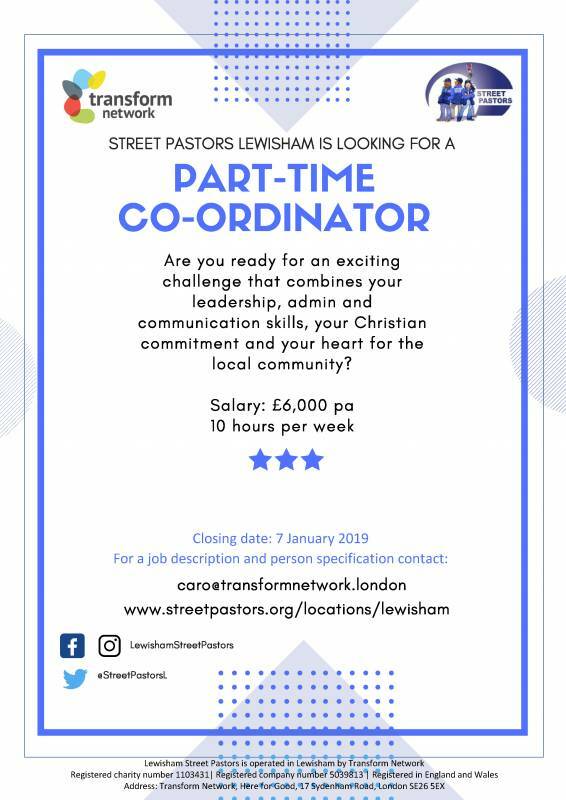 It also includes representing Street Pastors Lewisham locally with voluntary and statutory organisations and local businesses and promoting its work. Growing the work of Schools Pastors in the borough would also be a part of this. You will be a self-starter who combines excellent leadership, people and admin skills with a Christian commitment and a passion for your local community. You will be able to engage people from different church backgrounds, as well as develop links with, and present the work to local voluntary and statutory groups. This role will suit someone who is retired, or is financially independent. We are particularly looking for someone who is committed to social action and to seeing this work grow.